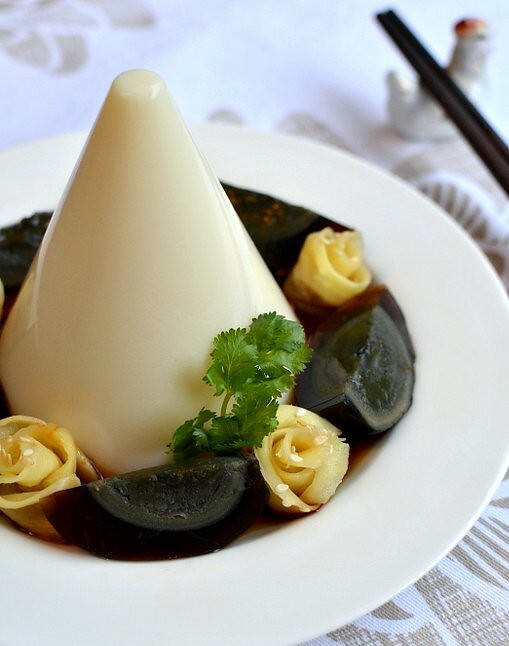 "To fu or not to fu"
Cold appetizer of silky tofu jelly and century eggs with a dressing of black vinegar, sesame oil, soy sauce, sesame seeds and coriander leaves. Served with pickled young ginger roses to refresh the palate between bites. This classic savory dish is made contemporary and elegant by using the Royal Selangor Pewter Jelliriffic! mould. My family loves cold tofu, especially on a hot day. I thought of making silken tofu the traditional way, with coagulants such as calcium sulfate or citric acid but was worried that the tofu would be too soft to turn out, especially since the tip of the cone is rather narrow. For most of my Jelliriffic agar recipes, I used 1 teaspoon of agar to 200 ml water to get a firm jelly. 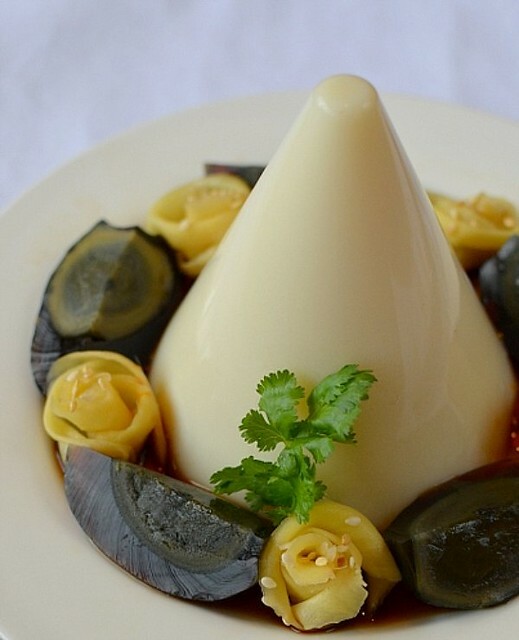 For this tofu jelly, I wanted a very soft jelly that could hold up its shape too. I made the first jelly with 1/2 teaspoon to 200 ml and the second jelly (we only have 2 moulds to work with) with 1/4 teaspoon to 200 ml. I like the second jelly better and will make another tomorrow with less agar and update the recipe if the jelly can keep its shape. A word about black eggs, better known as century eggs: they can be vile-tasting if you haven't eaten them before. But if you have, you belong to the group of people who know what the non-century egg-eating people are missing. So when tofu is made with agar, is it tofu or not tofu? Peel and slice young ginger thinly (not paper thin; too soft), mix in white rice vinegar, sugar (I used brown sugar for a deeper color) and salt. To make roses, do not let ginger pickle for too long or it'll go soft. 1. 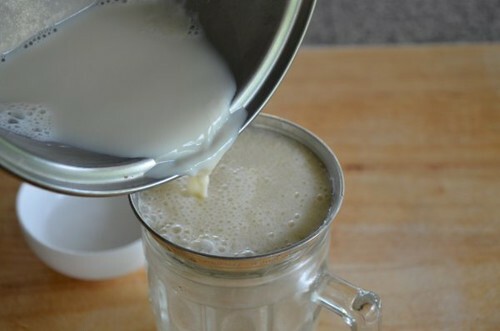 Put 100 ml soy milk into a small pot and scatter the agar over. Leave 2 minutes to soften and swell. Put pot over a low flame and heat, stirring all the time, until milk begins to steam and bubbles form at the side of the pot. Remove and add the remaining milk. Pour into a rinsed Nick Munro mould and when cool, put into fridge to set and chill. Chill at least 2 hours until very cold. 2. Turn tofu out onto a serving plate (drain any water away) and drizzle with the sesame oil, black vinegar and soy sauce. Arrange the ginger into rosettes, sprinkle with the sesame seeds and coriander leaves. Just before eating, cut the tofu (at the table) into chunks of about 1.5 to 2 cm and mix everything up. Oops. Forgot the sesame seeds. I waited until the next morning to cut the second and third tofu jelly so that I'll take better photos. You know what, I prefer the first and second jellies. The third one was too soft. This is a good recipe! 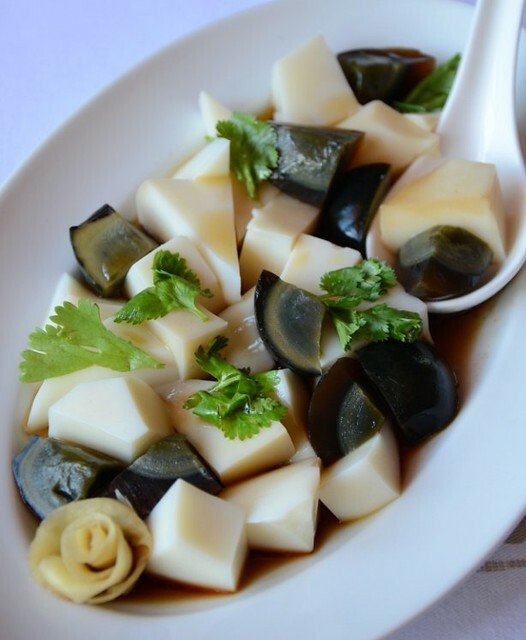 The tofu has the smooth silky texture of almond tofu and eaten cold with century eggs and a dressing of sesame oil, black vinegar and soy sauce, I bet it'll be a hit with your family and friends! Only thing I'll change is make the soy milk myself next time I make this dish because the jelly tofu made from commercial soy milk wasn't as intense in flavor as regular silky tofu. Try it soon! My goodness Terri, this looks so lovely and smooth! Now you making me crave for it. Simple recipes r usual hardest to make. This dish so beautifully done just goes to show yr skills n creativity. U really my idol...Nee. So smooth, so silky. Bravo on getting the soft texture you wanted and getting the consistency right that the cone stood strong. This jelly reminds me of Macau's steamed milk pudding. Lovely! find it rather strange :) haha! Can't wait for your next posting. Your roses are so dainty! :) This is a good one. Simple and elegantly dressed with a classic flavour profile. I like this very much! P.s. Now I need to start making those jellies instead of just commenting on them, hehe! I went thru all your jelly posts and you didn't have a tagline for "Almost Ispahan and "Poached Pears". Better rectify! I love the presentation! 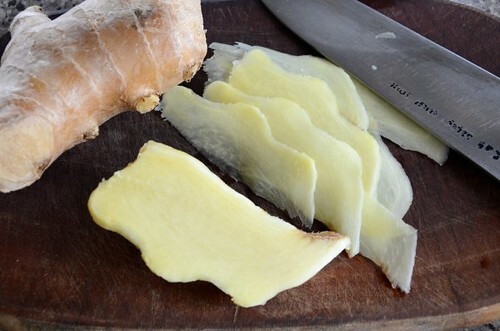 We used to make roses out of cooked carrots but I love pickeld ginger so this really makes my mouth water. Though I'm not a big fan of century eggs. Looks pretty though! You certainly make a difference by doing just that. You rock girl!!! That's it. After seeing all these jellies, I'm going to get that jelly mould! tou fu fa-like right? but i have not eaten them with century eggs before. gotta try them with the family one day. those ginger rose petals are adorable. you are definitely making reasons for me to keep tracks with updates on your blog. ;) jia you with the challenge. nice presentation! love the ginger rose..
so pretty...love the contrast, interesting combination! I suspect it's the dressing that holds the tofu and century egg flavor together! you have so many ideas,head off to you. This is so chinese and looked great. This tofu looks extra silky and smooth but maybe, no, can't imagine myself liking how it taste like. But it looks beautiful and certainly, very creative. Delicious! I never seen black eggs before! I would like to know where I can buy them or what I have to do to give to the egg this color.